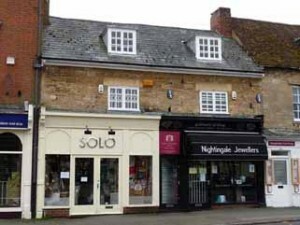 This double fronted property on the south side of the Market Place (now No. 34) was where Miss Mabley ran her private school for many years from c. 1811 to c. 1870. OLNEY, Bucks. MISS MABLEY gratefully acknowledges the liberal Support with which she has been favoured during the Period of 10 Years, and respectfully informs her Friends, that her SEMINARY will be RE-OPENED on MONDAY the 23rd of JULY – It is presumed that the Course of Education, and the Mode of Treatment adopted, will peculiarly meet the Views of those Parents who wish to direct the Attention of their Daughters to those Subjects which are particularly useful. Her establishment for a Limited Number of Young Ladies is intended to combine domestic comforts with intellectual, moral and religious Improvement. Board, with the Elements of the English Language, Plain and Fancy Work, 18 Guineas per Annum; French, Drawing, Music, Geography, with the Use of the Globes, Writing, and Arithmetic, on the most moderate Terms. Mary Mabley was around 30 years old when she began her school and possibly right from the start she had the help of a Mary Roote. Mary Roote (for about 40 years a Resident with Miss Mabley) interred in a brick grave 13th July 1845 aged 80 full fees £2.0s.0d. Another early teaching assistant could have been Miss Sophia Glendah who married by Licence, Mr Richard Roote, a bachelor from Soham, Cambridgeshire, on 30th November 1815 at Olney Parish Church. The witnesses were Thomas Glendah, quite likely the bride’s father or brother, and Mary Mabley. Was Richard Roote the son or nephew of Mary Roote? And while visiting his mother or aunt at Olney met his future bride! Such is the joy of speculation in local history research! Olney is fortunate in that the enumerator for the 1821 Census in going around the town listed the Householder’s name, occupation, religion, how many males and females in each household and the ages of those inhabitants in blocks of 10 years. This information was published in 2006 in a booklet available from the EurekA Partnership of Stoke Mandeville. Miss Mabley’s household consisted of one male and twenty-two females! As the male was aged between 5 and 10, it is quite likely he was the young brother of an older sister at the school. Six girls were aged between 5 and 10 years; ten were aged 10 and 15, with only two aged 15 to 20. The two aged between 40 and 50 would be Miss Mabley and Miss Roote. In Pigot’s Commercial Directory of 1823/24 Mary Mabley ‘s Ladies Academy is listed as being in the High Street (that is incorrect as the school was definitely on the Market Place at the time of the 1821 Census). However, in Pigot’s 1842 Directory, Miss Mabley’s school (boarding and day) is correctly listed as being in the Market Place. The consecutive numbering system around the Market Place, which was first used in the early 1890s, has varied slightly over the years, so the property, formerly Miss Mabley’s school, was sometimes listed as No. 34 and sometimes as No. 35 on the south side! Miss Mabley’s School occasionally received monetary donations from Miss Ann Hopkins Smith , the wealthy Olney Quakeress, who built the Almshouses in Weston Road in 1819. Mary Mabley’s faithful assistant, Mary Roote, was described as ‘of independent means’ in the 1841 Census. Also there on that Census night were a 25 year old school mistress, Ann Toombs (later to become Mrs Ann Beesley), as well as six pupils aged between 5 and 14 years and one servant. The 1851 Census revealed that Miss Mabley was born in Potterspury, Northamptonshire circa 1780. Elizabeth Lucy Walker aged 9 from Strixton. There was one 22 year old servant, Selena Shouler, born in Weston Underwood. Incidentally, walking was an exercise undertaken by Mrs Sample’s pupils, recorded by Samuel Teedon in his diary. ‘Croydon’s Weekly Standard’was later to become ‘The Bucks Standard’, and in two advertisements of 12 July and 31 December 1864 the school is listed as MISS MABLEY & MRS BEESLEY. By now Miss Mabley was around 85 and had the help of another teacher, Mrs Ann Beesley. This was the married name of the young school mistress, Ann Toombs of the 1841 Census. She was the niece of Miss Mabley and was widowed when only in her thirties and returned to Olney, during the mid 1850s, with her young family, to teach again in Miss Mabley’s school. This census revealed that Ann Beesley was still teaching in the private school on the Market Place, formerly run by Miss Mabley. Two of her daughters, Mary Jane aged 23 and Sarah Ellen aged 19 assisted her. There were five boarders, four girls aged 14, 12 and two aged 11, and a 7 year old boy. 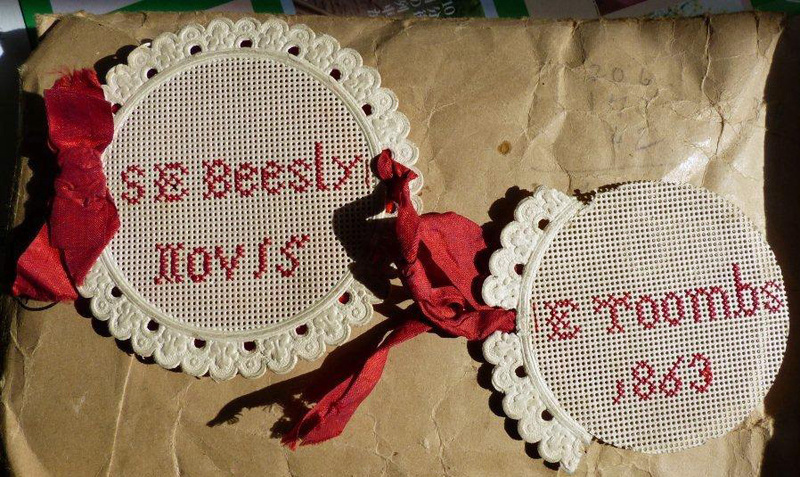 Sadly, Ann Beesley died of typhoid fever on 9th May 1871, aged only 57, just two years after Miss Mabley’s death, and was buried in the same grave. Presumably the school closed with Ann’s death. Miss Mabley and Mrs Beesley were not the only schoolmistresses around the Market Place and the next instalment will deal with other female Victorian teachers having their schools in that area. Ann Toombs, born circa 1814, was the daughter of Matthew Toombs, a carpenter on the Duke of Bedford’s estate at Woburn. After teaching at her aunt’s school in Olney for a time , Ann was married to Edward Beesley, a butcher. He had been educated at Kimbolton School in the town of the same name where his father was a butcher. Edward was apprenticed to the trade in London before returning to work in Northampton by 1838, which is probably where he met his future wife, as Miss Mabley’s school had pupils from the area around that county town. 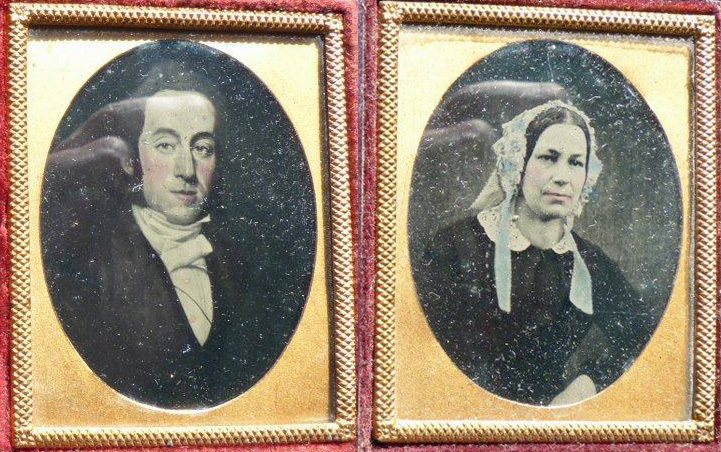 Two years later he moved to Ockbrook, near Derby, his absence may have made her heart grow fonder, for within a further two years Ann and Edward were married on 12 July 1842. Their eldest child, also Edward, was born in 1845, followed by three daughters within the next eight years. Ann was widowed at an early age, as her husband Edward died, aged only 37, on 9th May 1853, leaving her with four small children. She brought her family back to Olney and began teaching again in Mary Mabley’s school. 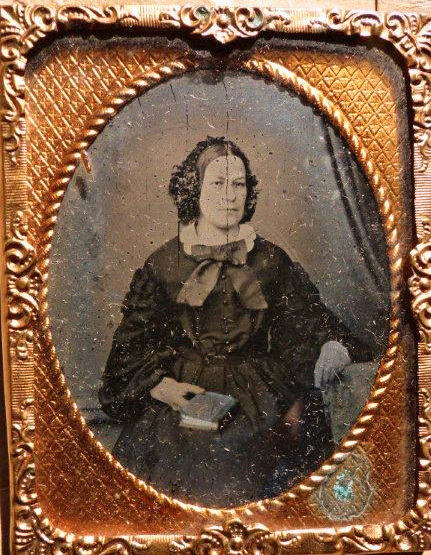 The dark clothing in the photograph may indicate that this photograph was taken during her early years as a widow. Ann died of typhoid fever on 9th May 1871 aged 57, and was buried in the same grave as Miss Roote and Miss Mabley in the Independent Chapel graveyard (now the United Reformed Church). Ann Beesley was an attractive woman, as were her three daughters Mary Jane, Sarah Ellen and the youngest (possibly named) Elizabeth. Her son Edward was a handsome young man. All were photographed about 1870 by William Wright, who was Thomas Wright’s father. The tale in the Knight family is that Ann Beesley’s three orphaned girls were befriended by the Owen family and went to live with them in their house half way down the west side of the High Street, opposite the Two Brewers Inn. Stephen Owen, then 42, was a shoe manufacturer employing over 50 men. His wife was called Sophie and they had a daughter, Emily, aged 20. A relative, Elizabeth Checkly aged 26 also lived with the Owen family. Presumably, Edward Beesley was away studying as he later became a teacher, initially at Manchester and later at Bristol. 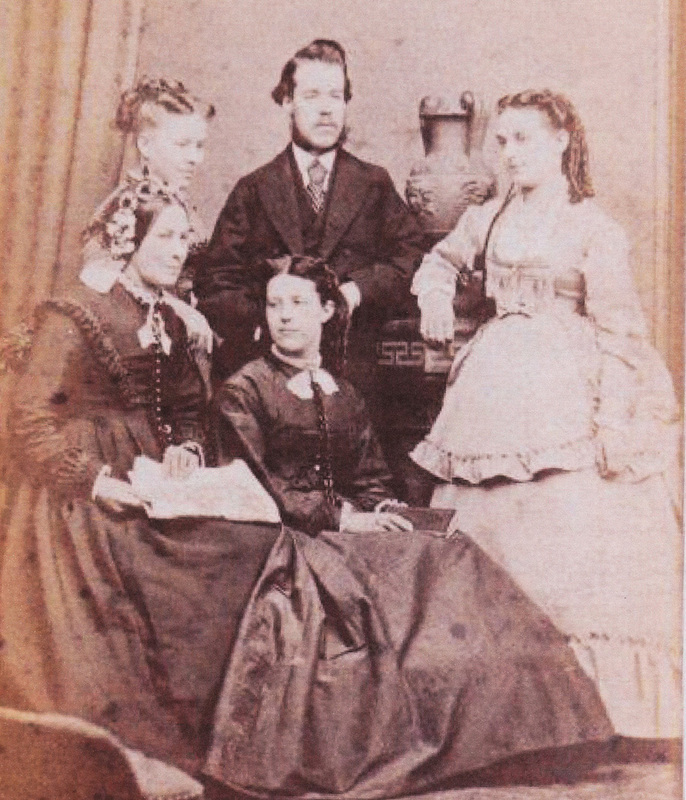 The Beesley family, Mrs Ann Beesley (seated on the left) and daughter Mary Jane (also seated) Standing: daughter Sarah Ellen, son Edward Francis and youngest daughter, possibly called Elizabeth Toombs Beesley. Fortunately, two years later there was something to celebrate when Ann Beesley’s eldest daughter, Mary Jane Beesley, married Jonathon Knight at the Independent Chapel on 22nd July 1873. In the 1871 Census, Jonathon, a wheelwright aged 24, was still living with his parents, Samuel and Martha Knight, in the cottage behind Orchard Side, the former home of the eighteenth century poet, William Cowper. The wedding photograph of Mary Jane Beesley and Jonathon Knight, 22nd July 1873. Seated front row: Sarah Lett nee Knight and baby, sister of groom; Martha Knight, mother of groom; GROOM; BRIDE; Mr and Mrs Owen. 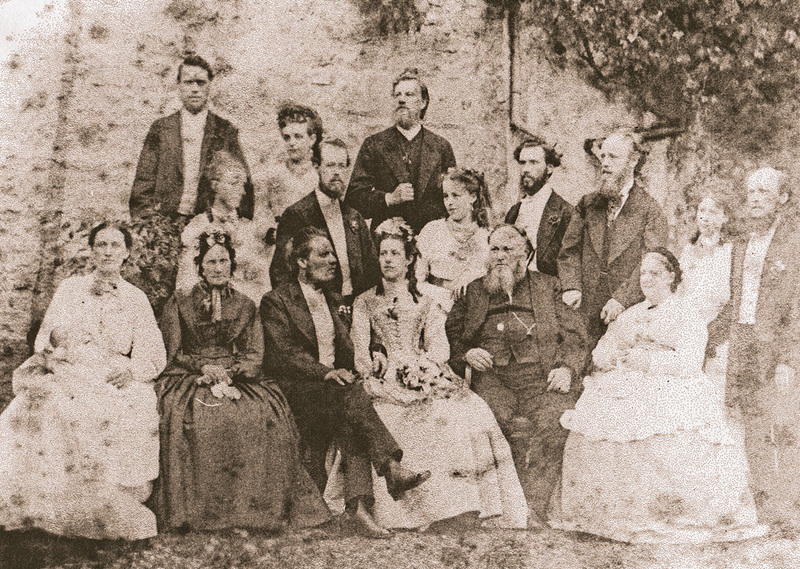 Standing behind: Thomas Knight, groom’s brother; Annie Wright; Sarah Ellen Beesley, bride’s sister; Edward Beesley, bride’s brother; unknown male (possibly James, son of Mr and Mrs Owen); bride’s youngest sister, possibly called Elizabeth Toombs Beesley; Joseph Knight, groom’s brother; William Lett, groom’s brother-in-law; Elizabeth Knight, nee Cleaver, and her husband Samuel Knight, groom’s brother. Samuel Knight was a journeyman baker and his wife ran a ‘child’s school’ (dame school) in the poet’s former Hall and Parlour. 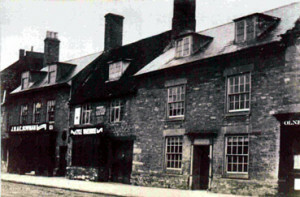 Jonathon and Mary Jane later settled in Wolverton where Jonathon became a carpenter in the Railway Works, rising to Foreman. They had three sons to carry on the Wolverton branch of the Knight family! Sadly, Ann’s two younger daughters, Sarah Ellen and Elizabeth, both died of tuberculosis in their early twenties. The next instalment talks about Mrs Mayes and other Olney Victorian school mistresses.